Over the years there has been some debate on when the first mill was built. 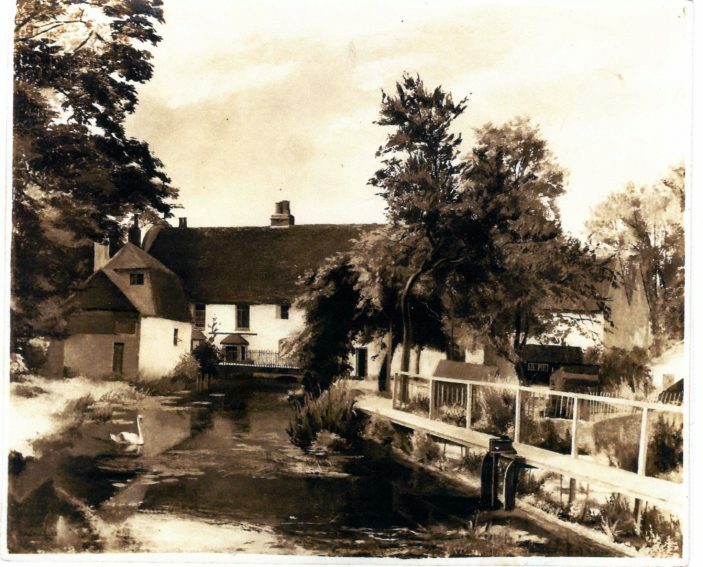 There are mentions of a Westmele” in the Doomsday book but various authorities have disagreed on which entries refer to Westmill in Ware and which refer to Westmill in Buntingford. The general consensus however seems to be that a mill has stood on this site across the river Rib for nearly 1,000 years with “some” entries in the Doomsday book referring to this Westmill. At this period it appears to have been owned by a member of the bodyguard of King Edward the Confessor and possibly tenanted by “Anschitel of Ware”, one of King Harold’s thanes (someone who held land granted by the king). In the 11th Century the mill and it’s surrounding land was granted (along with several other holdings in Southern England) to Ralph de Todeni, a Norman Knight who came over with William the Conqueror as a reward from the King after the conquest. Six generations of Ralph’s family held the Manor. In the 13th century ownership passed to a William De Halfhide whose family held it for eight generations until in 1464 Amy Halfhide, the sole heiress married William Munden. The Munden family had it rebuilt in 1580 with two mill-wheels; it was now the largest mill in Hertfordshire and the only one with two wheels. It passed from the Mundens by marriage to the Shotbolt family. Around 1610 it was sold by Philip Shotbolt to George Bromley, a citizen of London. George Bromley was an ardent royalist and during the civil war collected money and men for the Royalist cause whilst the mill was used as a corn victualling centre for horses. When the war went against the King, George Bromley went into hiding, however he was eventually captured and heavily fined and the Mill was confiscated by the Commonwealth. When Charles II was returned he gave the Mill back to George Bromley’s son George Jnr. The Bromley family were so impoverished by the Civil War that they had to sell the Mill to Thomas Feltham of Ware Priory. It was held by the Feltham family for three generations until Ralph Feltham sold it to Thomas Hall of Goldings in 1743. The first recorded miller was Joseph Frost who died in 1748. It was after this that the Tween family took over the running of the mill with at least 4 generations of John Tweens becoming the millers. Owner Thomas Hall died in 1770 and the manor was sold to John Scott of Amwell (Scott’s Grotto). However the mill seems to have been sold to a John Hammond who went bankrupt in 1777, it then passed through a number of hands in a few months. The Tween family remained the millers during this period, they had purchased the mill by 1798 and possibly after Hammond’s bankruptcy in 1777, they rented the house next door from Maria De Horne Scott the daughter of John Scott. The Tweens played a part in the Ware Bank and the female members of the family had money in their own right, a sign of wealth in those days. Throughout the 18th and 19th centuries the Mill was a prosperous one working the two wheels side by side. The Tweens were working millers and mealmen, at one time also taking over a smaller mill at Wadesmill, three miles upstream. In 1856 the last Tween at the mill, John Squire Tween, was made bankrupt. It seems the mill then passed in to the ownership of William King. During King’s ownership the miller was John Wyman French, who was just 17 and went on to found one of the largest milling and baking combines in England, J W French of Ware, the producers of “Frenlite” flour. By 1861 he was joined at Westmill by James Read, so there were then two millers but neither stayed long. In 1865 the mill was for sale, however it did not appear to sell; the miller at this point was a Mr Hockley. In 1871 there were again two millers working Arthur Corder and Robert Lewin. In 1872 Mr Corder took a 10 year licence from Mr King. 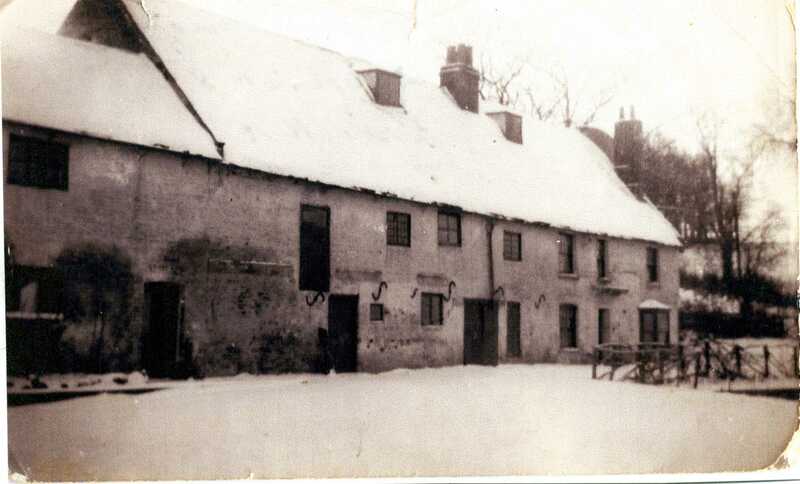 Robert Lewin moved on to the mill at Wadesmill so newly married George and Emily Hartley came to the mill at Westmill to assist Mr Corder about 1873. George Hartley was a miller and baker from Oxfordshire and Emily the daughter of a farmer from Ruislip. At some point the mill was sold to John Harry Ayres Parker of Ware Park and Mrs Emily Hartley subsequently acquired the freehold on 1 April 1895. By 1881 Emily’s niece Eliza aged 16 was with them. Also with them were two assistant bakers aged 18 and 22. It was with the coming of steam in the 1880s that the Mill declined in prosperity. About 1890 the niece Eliza returned to her widowed father and her sister Rose came to live with the Hartleys to help in the mill. George was an invalid by 1902 when Emily was running the mill, she had a legal dispute with Mr Hanbury who owned the Westmill and neighbouring Poles estates by this time. The papers on the dispute reveal that they had had a miller (Mr William Ball ) working with them from 1878. George Hartley died on 16th July 1904, his widow Emily continued as the miller and baker along with Mr William Ball and her niece Rose. William Ball died in 1907 but it seems his son Albert continued working with Mrs Hartley at the mill along with Rose until Rose died aged just 50 in 1918. Emily continued at the Mill until her own death on 8th April 1928 at the age of 80. Under the ownership of Mrs Hartleys niece, Emily Grace, who had inherited the mill, Mr Gobel, a miller and baker, was the next tenant. He took out a 99 year lease possibly as soon as Mrs Hartley died but certainly before 1932. He married Edith in 1935; she was the daughter of Thomas Baggs Vye, the publican of the Robin Hood at Tonwell. It was Mr Gobel who started the tea rooms for the cycle clubs who came out on trips from London. He continued with the mill until a catastrophe in 1936 when there was a huge storm. Someone upstream opened a sluice gate without telling Mr Gobel so he was unable to prevent the structural damage caused to the walls and mill wheels when a tree was bought down the river and under the house via the mill race. He was responsible for repairs which were beyond his means so the family had to leave and the mill was never worked again. The Mill was for sale later in 1936 along with the bungalow and tearooms, at that time it was owned by Mr A H Summerfield. There was a suggestion on the sales details that it could become a petrol station! It was withdrawn from sale at £675. The next tenants were Mr Ernest Zambra and his wife who continued with the tea rooms. Their daughter Annette was born in 1944 and around that time the tea rooms closed. She remembers that there had also been kennels on the site. Mr Zambra was a crane driver and pig breeder, and the family continued to live there until 1959. In 1946 the Ministry of Housing listed the mill as an ancient monument and a building of special architectural interest. Mr George Roberts purchased both the Mill and the adjoining Westmill House in 1939; he had a large plumbing and heating business in Bengeo. He lived in Westmill House from then until the death of his wife in 1958. In 1959 the mill was sold to Mr Mark Chapman Walker CBE, MVO. who had it restored and modernised in 1961. It was during the renovations that an architect who had worked at Hampton Court identified some of the foundations as Elizabethan. The Chapman Walker family had a stake in the News of the World where he was managing director. He had both the means and the vision to create the impressive house which today spans the mill stream. His initials are on the plaque over the front door dated 1962. In 1963 there was a government scandal involving Christine Keeler. The News of the World won the exclusive rights to her story and when she disappeared it is believed she was taken to Mr Chapman Walker’s country house for safe keeping. There are plenty of local stories that confirm she stayed at the mill for some time in the spring of 1963! In the 1970s the new road was built which left Westmill in its own cul-de-sac. Mrs Platten Williams who lived in Westmill House at the time got the access road moved to save the two horse chestnut trees. The River Rib is still a Parliamentary and Parish boundary so as the river runs through the house the owner has to decide where he wants to vote!